(Toronto, September 26, 2008) As the transformed AGO nears completion, it will host a light installation from October 4 to 5 as part of the third annual Scotiabank Nuit Blanche. For one sleepless night, artist Leo Villareal will create a metamorphosis of Frank Gehry’s transformed south facade. Responding to the architecture of Gehry, the artist will construct a light installation entitled Scintillator on the fifth floor windows of the AGO’s south tower. Villareal is the first artist to work on the new AGO’s contemporary tower. Sequenced through custom software, flashing LED fixtures will use the rules of physics to evoke cosmological, hypnotic and stellar effects. As part of Scotiabank Nuit Blanche’s citywide all-night contemporary art event, the installation is free and can be viewed from 6:52 pm on Saturday, October 4 until sunrise on Sunday, October 5 from Grange Park and down the John Street corridor as far as the Rogers Centre. Villareal, an American artist living and working in New York, is a graduate of Yale University. He combines LED lights and computer programming to create illuminated displays. Villareal has participated in countless exhibitions including: All Digital, Museum of Contemporary Art, Cleveland; Visual Music, Museum of Contemporary Art, Los Angeles; Art Among The Stars, Grand Central Station, New York; and Sculpture Now, Palm Beach Institute of Contemporary Art, Palm Beach, FL. Villareal’s work is included within the collections of the Museum of Modern Art, New York and the National Gallery of Art, Washington. This fall, the National Gallery of Art, Washington will unveil an installation by Villareal designed for the gallery’s concourse. 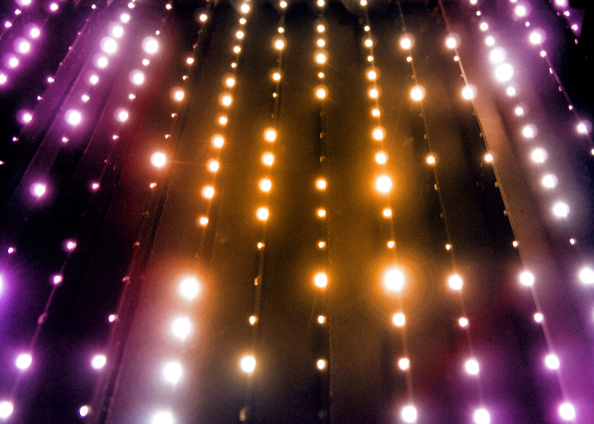 The work features approximately 40,000 LED nodes that run through channels along the entire length of the installation. Scotiabank Nuit Blanche is a highly anticipated event in Toronto due to its ability to make art accessible and interactive. An unprecedented 800,000 people visited the event last year. This year’s festivities promise to deliver a night of thought-provoking art. For more information visit www.ago.net or www.scotiabanknuitblanche.ca.